Iceland's Eyjafjallajökull volcano produced its second major ash plume of 2010 beginning on May 7. Unlike the response to the earlier eruption, which began on April 14, 2010, the reaction to the new plume was better informed. Aircraft were diverted as needed to avoid damage, and again some airports were closed. But across Europe, planes were not grounded altogether, in part because computer models were used to predict the spread of volcanic ash. Most air passengers completed their journeys with minimal delay. Among the key constraints required to run volcanic plume simulation models are the height to which ash is injected into the atmosphere, and the amount and timing of ash released. 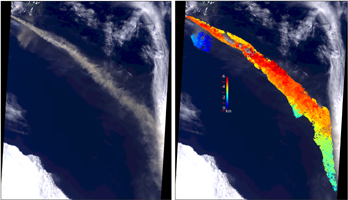 The Multi-angle Imaging SpectroRadiometer (MISR) instrument aboard NASA's Terra satellite passed just east of the Eyjafjallajökull volcano mid-morning on May 7, 2010, and viewed its ash plume for about 600 kilometers (373 miles) downwind. From MISR's nine different angular images, the height of the ash plume can be derived, using a hyper-stereo technique that also accounts for wind-driven cloud motion during the time between image acquisitions. On the left (Figure 1) is a natural-color, nadir (directly downward) view of the scene, with the volcano itself just off the upper left corner of the image, and the main plume extending to the southeast. At right (Figure 1) is the stereo-derived plume height, which is retrieved at 1.1 kilometer (0.68 mile) horizontal resolution, and with vertical accuracy of about half a kilometer (0.3 miles), from the MINX software tool. The MINX stereo-matching process uses the level of maximum spatial contrast to determine plume height. Much of the plume resides between 4 and 6 kilometers (2.5 and 4 miles) above the ocean surface (orange and red color in the right image), but descends to the 3 kilometer (2 mile) range (yellow-green) far downwind. Note also the smaller patch of ash plume near the source, within about 1 kilometer (0.6 miles) of the surface (blue in the right image), which appears to be traveling to the southwest. The Terra satellite is in a polar orbit, crossing the equator on the dayside at about 10:30 a.m. local time. With MISR's 400 kilometer-wide (249 mile-wide) swath, it images the entire Earth about once per week, every two-to-four days at higher latitudes. Another instrument on Terra, the Moderate Resolution Imaging Spectroradiometer (MODIS), has a single view but a 2,300 kilometer-wide (1,429-mile-wide) swath, offering complementary, daily coverage of the volcanic effluent. The combination of MODIS coverage and MISR plume height maps provides among the best constraints for aerosol plume evolution modeling. These data are being used in continuing studies of the Eyjafjallajökull ash plume phenomenon.